SOL_ID under construction for the Solar Decathlon in Cali, Colombia. Fine Art, Fashion, Furniture, Graphic Design, Illustration, Interior Design, Jewellery and Silversmithing, Music Technology, Musical Instrument Making, Photography, and,Textile Design. 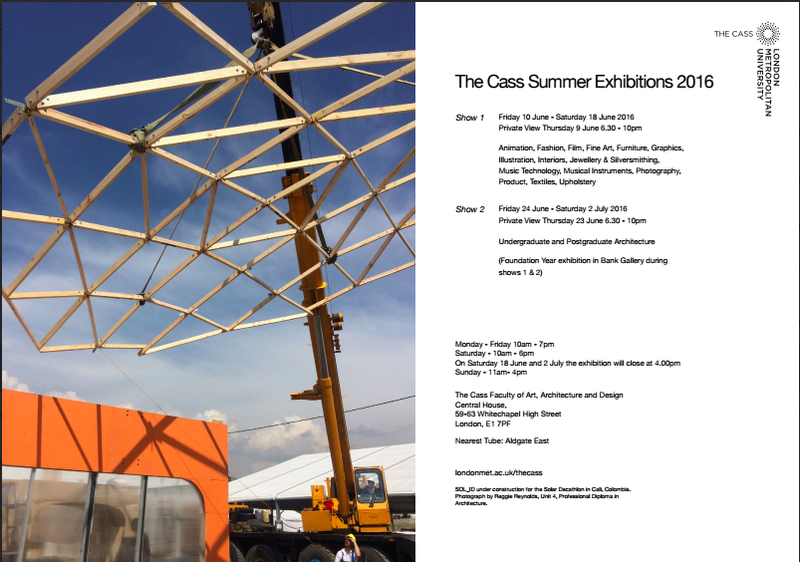 CASS Foundation/Extended Degree courses will exhibit their work in the Bank Gallery, Central House. Architecture BA, and MA, Spatial Planning and Urban Design MA, and, Professional Diploma in Architecture. From 10 to 18 June, students from our short and professional development courses will exhibit their upholstery work at our Commercial Road building. From 10 June to 2 July, students from our foundation/extended degree courses will exhibit their work in the Bank Gallery. This entry was posted in event, Exhibitions and tagged "graphic design", "interior design", 2016, animation, architecture, art, CAD, CASS, degree show, exhibitions, fashion, film, fine art, Foundation degree show, Graphics, illustration, interiors, jewellery, London Metropolitan University, music technology, musical instruments, photography, product, Professional short courses show, silversmithing, summer show, textiles, The Cass, upholstery. Bookmark the permalink.